This has to be one of the best movies of the year, right? If you have been following the buzz on Shane Carruth's Upstream Color, the writer/director's follow-up to 2004's Primer, you know that the movie is already in danger of being overhyped. The online community has gushed with praise. Critics have raved. The film has been a festival darling. It can be difficult for a film to live up to those expectations. 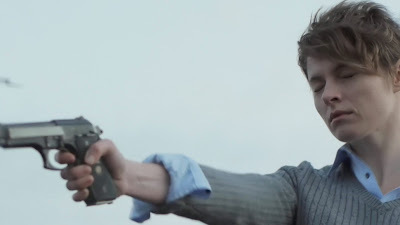 But Upstream Color is a movie that defies expectations, because there has never been a movie quite like it before. Do I even try to explain the movie's plot? To even attempt it can only ensure that a) you know you have to see it as soon as possible or b) you determine that you will never, ever see it. This is a movie that lives and dies by the emotional state of baby pigs. I don't say this to be funny. I say this to report a fact. Amy Seimetz plays Kris, a woman who is drugged by a man called only Thief. He gets her to swallow a small larvae, which leaves her in a highly suggestible state, which he uses to clean out her bank accounts and take everything from her. Left a blank slate with no memory of what happened, Kris reenters the world frightened and damaged, forced to start over and rebuild her life from nothing. She meets Jeff (Carruth), who is immediately and almost inexplicably drawn to her. The two share a connection they do not understand, and as they attempt to pick up the pieces of their pasts together, they discover the truth about what is happening to them. Or do they? Also factoring heavily into the plot are a pig farmer (called Sampler) who makes music and a pair of women who grow and sell a very special breed of orchid. Yes, the plot summary sounds either fascinating or laughable (or both), depending on your tolerance for the kind if heady science fiction in which Carruth specializes. 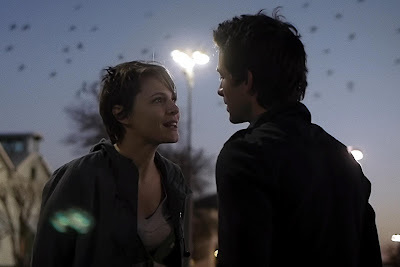 But Upstream Color is some kind of crazy high wire act, one which could easily fall apart at any time but which succeeds on the strength of its own audacity, ambition and richness of its themes. The movie presents all the information we need up front, but its meanings can become obscured because we won't allow ourselves to connect the dots. A leads to B, B leads to C, but A and C have absolutely nothing to do with one another. Upstream Color can be a challenge, but never without reward. Just when I was being pulled out of the movie because I was being asked to accept the intensity of a relationship that had not been earned, Carruth reveals another layer that addresses precisely that concern. The movie accomplishes that feat over and over again; it gets purposefully oblique and confusing, but then introduces a new turn or development that draws us deeper into the story. It is sad and haunting and beautiful. It is honest about the cycles of relationships and the ways that we protect ourselves in the process of falling in love. Dialogue is used only sparingly, and the editing time shifts the sequences, creating repeating patterns (one of the film's major themes) with a kind of propulsive rhythm that first lays out like puzzle pieces but gradually gives way to a kind of paranoia. It's also a gorgeous movie to look at -- one which carefully considers its images and earns its comparisons to the work of Terrence Malick, even though Carruth's photography is used for very different ends. Whereas Malick will hold on a shot of nature and hope that our minds wander with open-ended questions, Carruth photographs the natural world as a way of closing a loop -- it provides answers, not more questions. That's not to say the movie isn't very beautiful. It is. But there is a coldness to its beauty. Nature is not welcoming in Upstream Color. Nature provides another means of controlling us. So what is the movie ultimately about? I couldn't say for sure. I don't think I'm Room 237-ing it (and according to one of our recent commenters, that is for sure a thing) by suggesting that it's a movie with dozens of possible readings. It's been said that the movie is about addiction or co-dependent relationships. To me, the movie is a critique of capitalism and where it intersects with art. Consider what Sampler does to create his music -- who and what are exploited, and the ways in which he goes about it. The film is all about cycles, and it seems that one of the cycles Carruth is exploring is the cycle of commerce. To describe it much further would require spoilers. We'll talk more after everyone has seen the movie. I wish I could say that I understood everything that Carruth was up to in Upstream Color on a single viewing. I did not. I had to do some digging and read up on it. Yes, I could have just stuck with my initial impressions -- it's the kind of movie that works just because the imagery (shot by Carruth) and music (scored by Carruth) can wash over you. But the more I examined it, the greater it became and the more I wanted to watch it again, to pick it apart further and explore it even deeper. It's a great movie that will only keep getting better. Upstream Color is currently playing in limited release and is available on iTunes, Blu-ray and DVD. See it in a theater if you can. Got this to review for the Verdict, Patrick, and it's just amazing. Even better on the second viewing, too.